We offer a variety of Destin vacation rentals that provide everything you and your family will need for a fantastic stay. Each of our rentals offers its own set of amazing amenities, so you will have no trouble finding something that has everything you are looking for. You can stay just minutes from all the action in town, enjoy gulf-front swimming pools, basketball courts, video games, a movie theater, and so much more. Inside your rental, you will have all the common necessities so all you have to bring is yourself and your suitcase. Destin is full of family fun! Around every corner are exciting attractions that people of all ages will love. One of the best places to visit is HarborWalk Village, which is at the center of all the fun in Destin. There are restaurants, activities, and entertainment for the whole family! Kids will love trying the zipline that offers incredible views of the gulf and the boats entering the harbor. For a wet and wild adventure, visit Big Kahuna’s Water & Adventure Park, which has more than 40 different water play areas, rides, slides, and pools! Relax in the lazy river, try a thrilling slide, or splash around in the wave pool. Of course one thing you have to make time for on your family vacation is enjoying the gorgeous white sand beaches. Whether you’re splashing around in the waves or building a sandcastle, you can have hours of fun in the sun. You can even go on a dolphin cruise, or have fun out on the water with a wave runner or paddleboard rental. Make sure to collect some seashells to take back home with you! While you’re in town, take the time to sample some of the delicious local cuisine! 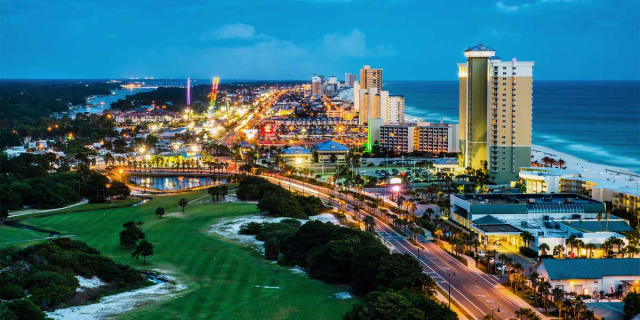 Destin is full of family-friendly restaurants that will satisfy everyone’s appetite. If you want seafood, head to Dewey Destin’s! This restaurant has a casual atmosphere with everything from fried shrimp to crab legs. And you can never go wrong with pizza! Landshark’s Pizza has pizza, wings, burgers, hot subs and more. One of the most popular of all is LuLu’s, which is all about fun. Enjoy great food like cheeseburgers, seafood, sandwiches and tacos in a family-friendly environment. There is even a special menu just for the kids! 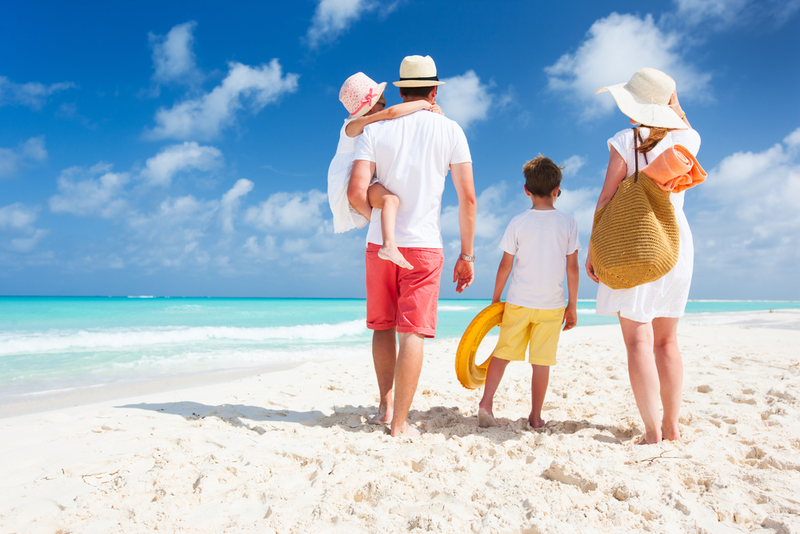 Now that you know the best tips for planning the perfect family vacation in Destin FL, it’s time to make it official! Take a look at all of our Destin vacation rentals and find the best one for your stay. OPEN Apr 26 to 28 $524! $1400/mo for Winter - Real Joy Fun Pass - Shuttle to Beach - GULF Views! OPEN May 1 to 3 $589! OPEN Apr 22 to 24 $458! OPEN Apr 30 to May 2 $656! $1500/mo for Winter - Real Joy Fun Pass - Shuttle2Bch - Lagoon Pool! OPEN May 4 to 7 $797! OPEN Apr 28 to 30 $991! OPEN Apr 26 to 28 $554! OPEN Apr 28 to 30 $751! 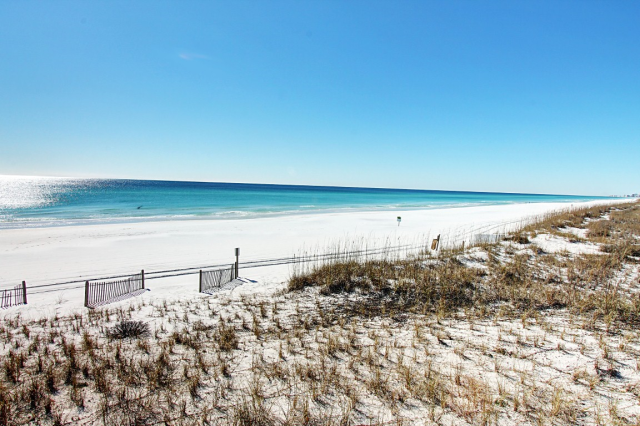 $1800/mo for Winter - Real Joy Fun Pass - Heart of Destin - 100 ft to beach! Fabulous Views! OPEN Apr 21 to 24 $724! OPEN Apr 21 to 24 $1360! OPEN Apr 26 to 28! OPEN Apr 26 to 28 $923! OPEN Apr 30 to May 2 $607! Real Joy Fun Pass - FABULOUS Gulf Views! - Steps to Beach-$1400/mo for Winter! OPEN Apr 20 to 22 $634! OPEN May 4 to 7 $788! OPEN Apr 21 to 23 $580! OPEN May 4 to 6 $1548! OPEN May 4 to 7 $764! OPEN Apr 21 to 23 $634! $1500/Mo for Winter - Real Joy Fun Pass - Shuttle2Beach- TWO Master Bedrooms! OPEN Apr 19 to 21 $670! OPEN Apr 22 to 24 $618! OPEN Apr 21 to 24 $733! OPEN May 21 to 24 $794! OPEN Apr 28 to 30 $507! OPEN Apr 26 to 28 $710! OPEN Apr 21 to 23 $635! OPEN Apr 14 to 16 $520! OPEN Apr 22 to 24 $623! OPEN Apr 20 to 22 $630! OPEN Apr 22 to 24 $578! OPEN Apr 20 to 22 $670! $1500/mo for Winter - Real Joy Fun Pass - Shuttle 2 Beach - 9th Floor - FULL 2 Bedroom! OPEN Apr 28 to 30 $643! OPEN May 21 to 24 $1102! OPEN Apr 28 to 30 $1492! OPEN Apr 26 to 28 $599! OPEN Apr 20 to 22 $569! OPEN Apr 21 to 23 $572! OPEN Apr 21 to 23 $597! OPEN Apr 22 to 24 $563! 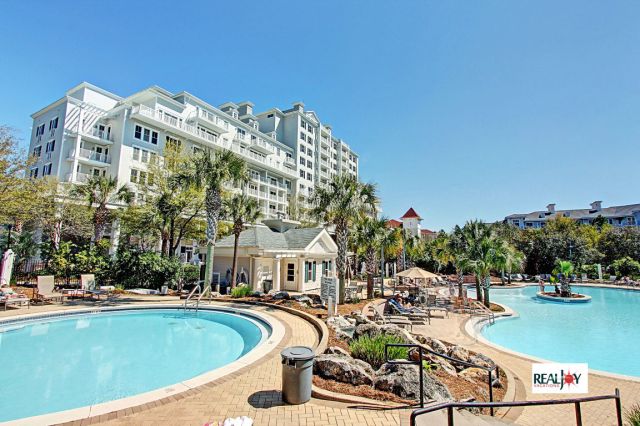 $1400/mo for Winter - RealJoy FunPass - Gulf Views - Heart of Destin! OPEN Apr 21 to 23 $396! OPEN Apr 27 to 30 $1283! OPEN Apr 29 to May 1 $1343! OPEN Apr 22 to 24 $597! OPEN Apr 29 to May 1 $387! Walk 2 Beach ~ Heated Pool & Hot Tub ~ 1 Mile to Destin Commons ~ $1150/mo Book 4 winter! OPEN Apr 28 to 30 $1160! OPEN May 1 to 4 $777! OPEN Apr 27 to 29 $890! OPEN Apr 28 to 30 $786! OPEN Apr 21 to 23 $790! OPEN Apr 26 to 28 $1208! OPEN Apr 26 to 28 $747! OPEN Apr 23 to 25 $598! OPEN Apr 25 to 27 $554! OPEN Apr 22 to 24 $639! OPEN Apr 27 to 29 $597! OPEN Apr 22 to 24 $717! OPEN Apr 27 to 30 $834! OPEN Apr 22 to 24 $1126! OPEN Apr 18 to 21 $587! Real JOY Fun Pass - 9th Floor - Serene Views - Lagoon Pool! OPEN Apr 29 to May 1 $578! OPEN Apr 26 to 28 $897! OPEN Apr 28 to 30 $881! OPEN Apr 28 to 30 $1401! OPEN Apr 26 to 28 $676! OPEN Apr 26 to 28 $761! OPEN Apr 21 to 24 $637! OPEN Apr 27 to 30 $729! OPEN Apr 20 to 23 $776! OPEN Apr 30 to May 2! $1450/mo for Winter - RealJoy Fun Pass - Pool and Gulf Views! OPEN Apr 25 to 28 $920! OPEN Apr 29 to May 1 $726! OPEN Apr 21 to 23 $638! $1750/MONTH for Winter! Real Joy Fun Pass* Shuttle2Beach - TWO Master Bedrooms! $1400/mo for Winter - Real Joy Fun Pass - Shuttle to Beach - 12th FLOOR VIEWS! OPEN Apr 22 to 24 $667! OPEN Apr 21 to 23 $1,019! OPEN Apr 28 to 30 $456! OPEN Apr 28 to 30 $840! OPEN May 4 to 6 $707! RealJoy FunPass - Spectacular Gulf Views!-$1900/mo for Winter! OPEN Apr 21 to 23 $556! OPEN Apr 27 to 29 $865! RealJoy FunPass - STUNNING Views! $2200/mo for Winter ~ Complete REMODEL March 2017! $1400/mo for Winter - Real Joy Fun Pass - Shuttle2Beach - POOL Views! OPEN Apr 30 to May 2 $626! OPEN Apr 28 to Apr 30 $593! $1400/mo for Winter - Real Joy Fun Pass- Shuttle2Beach- Lagoon Pool- TOP Floor! OPEN Apr 30 to May 2 $955! OPEN Apr 23 to 25 $585! BEACH Service - BeachFront - GROUND Floor - RealJoy Fun Pass * $1250/mo 4 winter! OPEN May 5 to 8 $923! $1700/mo for Winter - Real Joy Fun Pass - Beach Service - Gulf Views - 300 Steps to the Beach! OPEN Apr 24 to 28! OPEN Apr 21 to 24 $1320! OPEN Apr 21 to 23 $578! OPEN Apr 21 to 23 $480! $1400/mo for Winter - Real Joy Fun Pass - Partial Gulf & Pool Views - Near Destin Harbor! $1400/mo for Winter - RealJoy Fun Pass - Shuttle2Beach - 7th FL POOL Views! OPEN Apr 21 to 23 $590! OPEN Apr 27 to 29 $884! OPEN Apr 22 to 24 $925! $1900/mo for Winter - Real JOY Fun Pass- Gulf Front views from Balcony - Ideal Destin Location! OPEN Apr 28 to May 1 $727! OPEN Apr 21 to 23 $551! OPEN Apr 26 to 28 $551! OPEN Apr 26 to 28 $1371! OPEN Apr 23 to 25 $578! Exclusive Destiny by the Sea - Private Pool- Golf Cart - 100 yards to Beach - Fully Renovated! OPEN Apr 19 to 21 $647! $1400/mo for Winter - Free Daily Activity - 10th Floor - FABULOUS Pool Views! OPEN Apr 26 to 28 $1224! OPEN May 1 to 4 $737! OPEN Apr 24 to 26 $574! OPEN Apr 28 to 30 $409! OPEN Apr 20 to 22 $842! OPEN Apr 27 to 29 $675! OPEN Apr 21 to 24 $1003! OPEN Apr 21 to 23 $592! OPEN Apr 30 to May 2 $675! OPEN Apr 28 to 30 $1066! OPEN Apr 30 to May 3 $770! $1500/Mo for Winter - RealJoy Fun Pass * 5*Reviews! Gulf Views w/ Balcony! OPEN Apr 29 to May 1 $419! OPEN Apr 27 to 29 $403! FAB Kitchen Remodel- Huge Balcony- Gulf Views- RealJoy Fun Pass - $1150/mo 4 Winter! OPEN Apr 21 to 23 $1118! OPEN Apr 28 to 30 $1104! OPEN Apr 21 to 23 $584! 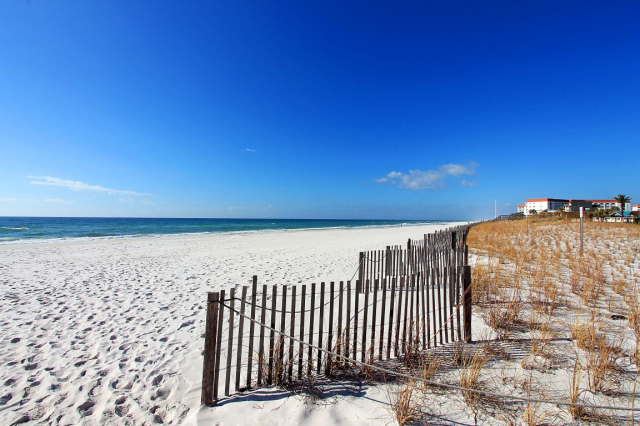 Crystal Beach is a Seaside-like development on the east side of Destin showcasing lovely vacation rentals. The highly desirable neighborhood has attractive, lush landscaping and is maintained in pristine condition. It's a… Read More. 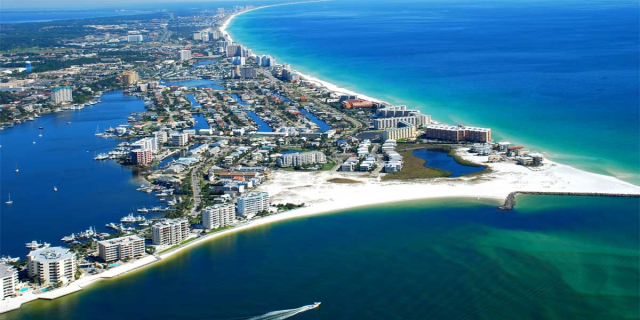 East Pass is located on Holiday Isle, which is a peninsula surrounded by the Gulf of Mexico and Destin Harbor. This destination is sure to please! 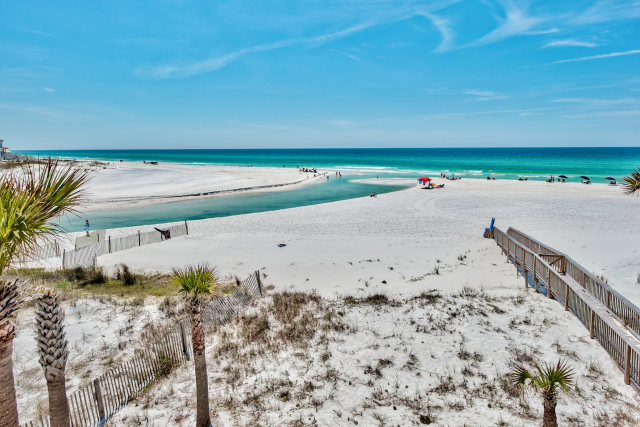 East Pass is situated in the heart of Destin on Holiday Isle's furthest point… Read More. Gulf Terrace has an amazing location right in the heart of Destin across the street from the beach! With views overlooking the lake, vacation rentals at this property also has a washer/dryer for your convenience. Enjoy the… Read More. 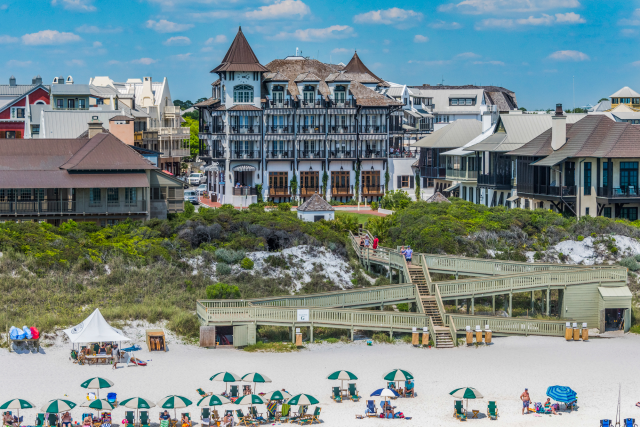 Holiday Surf & Racquet Club is located directly on the beach in exclusive Holiday Isle in Destin, Florida, which is a peninsula surrounded by the Gulf of Mexico and Destin Harbor. Vacation rentals here enjoy an elevator located… Read More. Sporting a great location across from Big Kahuna's Water Park, Pelican Beach Resort offers all the amenities you’d expect in a resort! This Beach Front Resort offers THREE Pools including Gulf Front pool, Lake Front pool… Read More. Across from Big Kahuna's Water Park, The Terrace at Pelican Beach in Destin, Florida, offers an outdoor heated pool, hot tub, outdoor gas grills, tennis courts, a video game room, meeting facilities, and covered parking… Read More. You can't beat this location in the heart of Destin! Vacation rentals at Shoreline Towers enjoy being within minutes from restaurants, shopping, water sports, fishing and golf. The amenities offered at this well-managed… Read More. The Silver Beach Towers Resort offers 600 feet of private white sand beaches, two Gulf-front pools with waterfalls, free Wi-Fi, 2 hot tubs, tennis courts, private covered parking, and BBQ grills. It is located in central… Read More. A beautifully landscaped eight-acre oasis is the hidden jewel found only at Silver Dunes Condominiums. 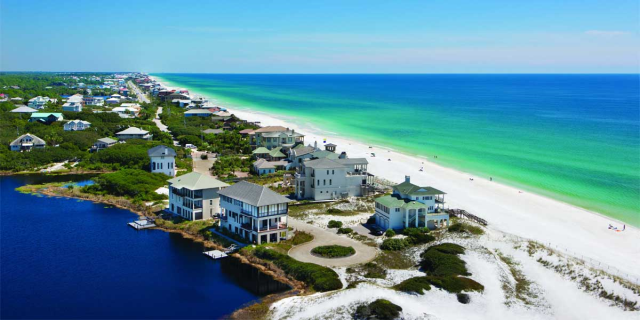 Located at the emerald waters of Destin in the Panhandle of Florida, you'll love beginning your day by watching the sunrise… Read More. Make plans for a fabulous vacation in Destin at Silver Shells! With luxurious vacation rentals, on-site amenities are plentiful as they include indoor/outdoor pools, spa, Ruth's Chris Steak House, tennis and basketball courts… Read More. St. Martin Beachwalk Villas is a newer complex in Destin boasting a lovely pool with plenty of lounging space, a grilling area, and path to the beach with rinsing station. This vacation rental is in a great location in the… Read More. Location and stunning views, anyone? Experience the heart of Destin in this lovely vacation rental complex. Sterling Sands is located across the street from The Tracks Family Recreation Center, with mini-golf and go-kart… Read More. Sterling Shores is a gated, 11-story complex in the heart of Destin. Boasting a 4300 sq.ft. private lagoon pool, gulf front pool, commercial grill area, 42-seat surround sound movie theater, BBQ grills, picnic area, and exercise… Read More. Sundestin is a vacation rental complex conveniently located in the heart of Destin, less than half a mile from Big Kahuna's water-park. It is unmatched terms of facilities and guest services: check out the two pools (outdoor… Read More. Terra Cotta Terrace is a luxury development of Mediterranean-style homes in the highly sought-after Crystal Beach area. The neighborhood has private gated beach access just across Scenic Hwy 98. Amenities include a community… Read More. The Islander is located on Holiday Isle, which is a peninsula surrounded by the Gulf of Mexico and Destin Harbor. This destination is sure to please! The Islander features Two Pools, Two Hot Tubs, Lighted Tennis Courts,… Read More. 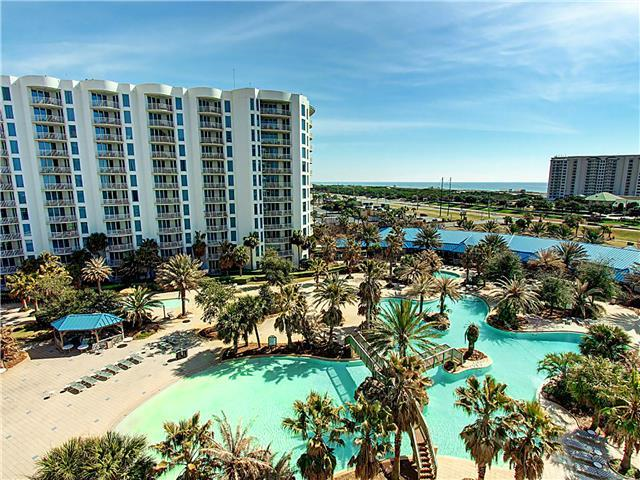 Located on 15 beautiful acres, The Palms of Destin Resort and Conference Center offers an unbeatable, upscale experience in the heart of Destin at an affordable price. As an exclusive guest at this lovely vacation rental… Read More.